From right to left - Mike Pingleton, Chris Smith, and Don Becker. In southern Georgia the end of January is late winter / early spring, and many species of amphibians (and a few reptiles) are already on the move. After a 20+ hour drive, we arrived late in the evening and despite wanting to sleep, us northerners could not pass up the opportunity to chase down some calling frogs (something that was still ~ 2 months away for me in Minnesota). Spring Peepers (Pseudacris crucifer) were calling in force (this is the same species we have in MN), however another species of Pseudacris was calling that caught our attention… It took a bit of work, but we finally located our first Ornate Chorus Frog (Pseudacris ornata). These little guys are related to our chorus frogs, and come in a variety of colors. Most common at the sites visited were brown individuals, but we did luck upon a few green individuals (pictured). Also common in the wetlands were Southern Cricket Frogs (Acris gryllus). A few Eastern Newts were also observed before turning in for the night. Ornate Chorus Frog (Pseudacris ornata). The next morning we got up early to take advantage of the warmest day of our stay. We joined up with more of ‘Team Orianne’ and headed out to a couple research sites they have on private property. Much of the area is on sandy soils, and large tracts of land are owned by relatively few private individuals and are used to produce timber (mostly pine). The Orianne Society has done a great job of working with these landowners, and some are even restoring areas of their property specifically for species that prefer areas of Longleaf Pine (an imperiled ecosystem). These Longleaf Pine habitats have sparse canopy cover and have a similar feel to our oak savannas and Jack Pine barrens in Minnesota. Like our savannas/barrens, these habitats are a fire dependent ecosystem and have numerous prairie grasses and forbs growing in the understory. With a sunny sky and temps creeping into the 60s Fahrenheit, it didn’t take long for our group to turn up one of our two reptilian targets – the Eastern Diamondback Rattlesnake (Crotalus adamanteus). The largest of all rattlesnakes, the individual we found did not disappoint! Over 4’ long it was an impressive sight! The snake had recently consumed a large meal (likely a rabbit) so it looked even larger at first glance. Checkout this short video of it rattling. With one of our main targets out of the way, we proceeded to look for Eastern Indigo Snakes. After about an hour of hiking around, Dirk Stevenson (Fire Forest Initiative Director at Orianne) shouted out that he found one… It was a large male and was still cool to the touch so it had not been out long. After a photo shoot and data collection, we let the individual go where found. Retracing our steps back toward the truck, we encountered another large male with its tail still inside the burrow. It was a full 6’ 9” -- an impressive snake (this is the individual being held in the top image). After this find, we made our way back to the vehicles to meet up with our larger group. 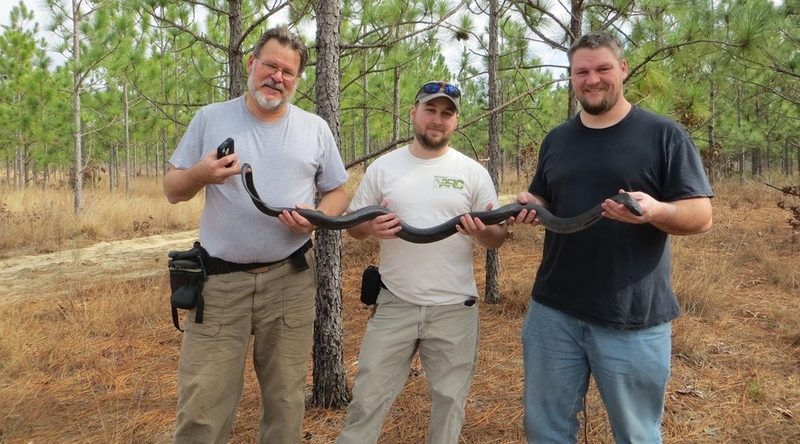 These folks had also found a few Eastern Indigo Snakes, and were still in the process of measuring and marking them before release -- a great way to end a day. Lifer Eastern Indigo Snake (Drymarchon couperi). Little Grass Frog (Pseudacris ocularis). Rain and cooler weather moved in on day 2. Finding snakes was out, but cool and rainy weather is perfect for salamanders and frogs. After having a little fun with the rental van and the iPhone's slow-mo video feature (see video), we headed out into the field. The most commonly encountered salamander was the Ocmulgee Slimy Salamander (Plethodon ocmulgee). We also encountered a few Marbled Salamanders (Ambystoma opacum) – a beautiful species of mole salamander. After an afternoon rest to dry off and eat, we headed back out in the evening to target calling frogs. High on the list to see was the Little Grass Frog (Pseudacris ocularis). This is one of the smallest vertebrates in the world, and is endemic to the SE US. To find this species we descended upon an area of open wet meadow / emergent wetland with shallow standing water. There were a few individuals calling in the distance, but they became silent when approached (go figure). 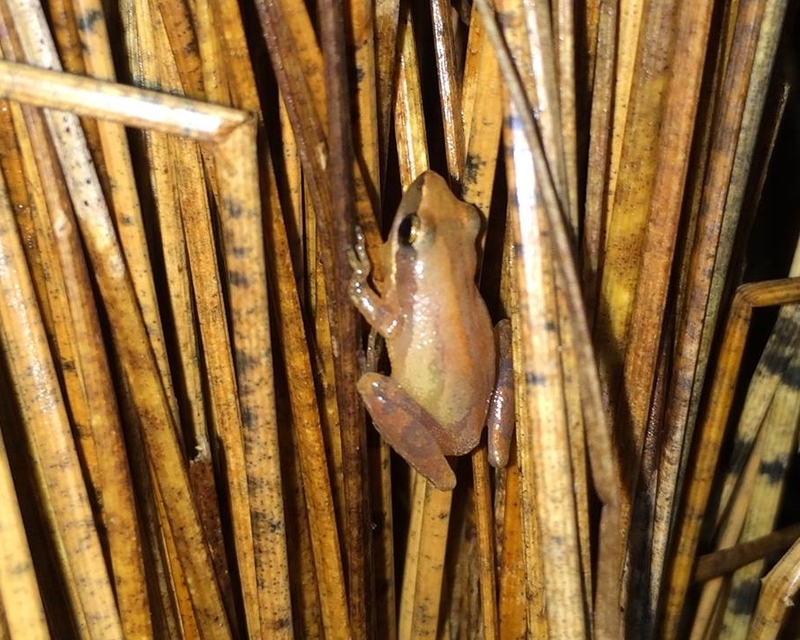 We were struggling to find these needles in a haystack, but then it started raining… Once the rain started, dozens of these tiny frogs started calling and right away we started finding them sitting on the outside of clumps of grass -- they were literally everywhere! The next challenge was getting a decent photo without spooking the frog into thicker grass while preventing our cameras from getting soaked. The next (and last) day of the trip dried out for us but was on the cool side. We didn’t have much hope for finding snakes, but we were happy to just get out and explore. We drove to a neighboring county to meet up with a TNC site steward to explore some property. We had Charlie the indigo sniffing dog in training with us as well. The area is filled with unique geologic features (for the area) and home to many rare and even a few endemic plants. One of the plants observed during our visit was Cutleaf Penstemon (Penstemon dissectus) which is endemic to Georgia. Some of the area had recently been burned, and in this area we lucked out and I found a small indigo snake. Little is known about juvenile indigo snake behavior, and this find represented the smallest individual (~ 2 years old) found at the property. Blog post by Christopher E. Smith (FieldEcology.com). Be sure to get the latest blog entries by signing up for blog updates by subscribing via e-mail or following on Twitter. Acknowledgments: I would like to thank The Orianne Society for hosting us during our staff. 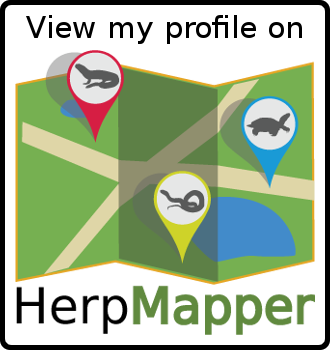 Become a member to support their important work, and for your invite to one of their many field-herping events. Note: All herps were handled with proper permits and no vans were harmed during the making of this video.